A collective feeling of national pride engulfed the Kingdom of Saudi Arabia this week as the nation rose in unison to celebrate its 88th National Day. This was no spontaneous outpouring of joy but rather a profound communal recognition of the Kingdom’s prolific achievements to date. Extraordinary firework displays lit the skies as a fusillade of colors and patterns burst out for onlookers to marvel over. For those taking to the streets draped in the national colors of emerald green and brilliant white, it was also an opportunity to absorb the spirit of exhilaration that has come to symbolize the future under the Kingdom’s Vision 2030 program. Guided by The Custodian of the Two Holy Mosques King Salman ibn ‘Abd Al-‘Aziz Al Sa’ud, the ambitious transformation of Saudi Arabia is being implemented under the direction of HRH Crown Prince Muhammad ibn Salman ibn ‘Abd Al-‘Aziz. Buildingupon the achievements of the past, Vision 2030 promises a new era of prosperity for the Kingdom and has already delivered tangible results for all to see and savor. For the first time on this year’s National Day, women could be seen behind the wheel as their children smiled and waved the Saudi flag from car windows. National programs to diversify the economy and provide jobs for local youth are well underway. The Kingdom’s leadership has laid down a plan for the nation’s future that revolves around the prosperity of its citizens — the Kingdom is delivering, and Saudis are rising to the call. At Saudi Aramco, the feeling of national unity and pride was as fervent as ever. Through its high profile downstream business strategies, the company is playing a pivotal role in the Vision 2030 program. And at the King Abdulaziz Center for World Culture (Ithra), the dreams of tomorrow’s Saudi Arabia are already a reality. On National Day, visitors flocked to the iconic architectural masterpiece, which stands majestically on the Dhahran highway. Under the evening’s moonlight, its outer shell was transformed into a sea of green embossed with spectacular 3-D imaging in recognition of the day’s celebrations — a feast for the eyes. Yet under its shell, it is Ithra’s outreach programs that have become a beacon for innovation and creativity, promising to unleash a new of wave of local talent in which the Kingdom — and world at large — can take pride. The 88th National Day celebrated the wheels of prosperity that are propelling the nation to a new age of success. Young and old, male and female, all rejoiced, which was a reflection of the trajectory the Kingdom is taking — united. 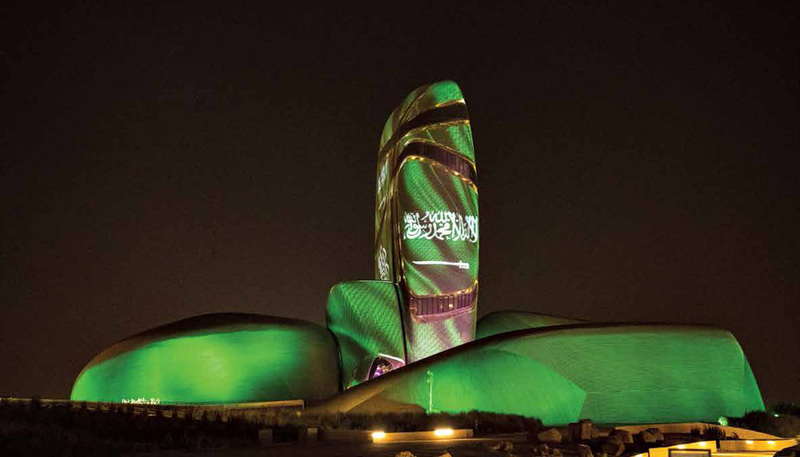 At the King Abdulaziz Center for World Culture, the outer shell of the iconic structure was alight with spectacular imagery in recognition of National Day and the contributions of past and present leaders of the Kingdom. 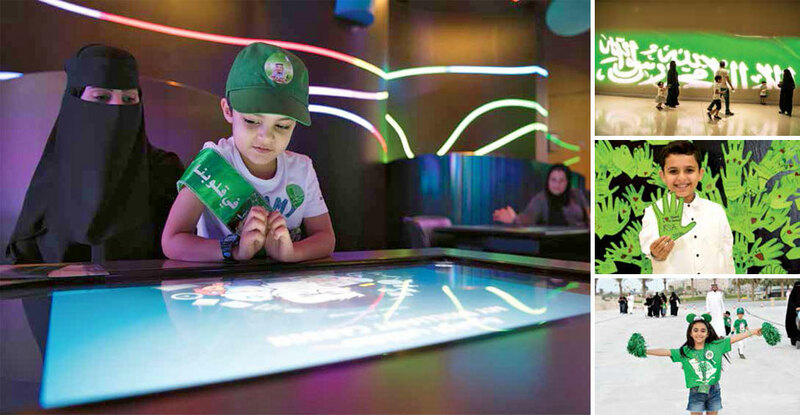 The Center’s innovative and creative outreach programs are part of the company’s efforts to bring to fruition the goals of the Kingdom’s Vision 2030. 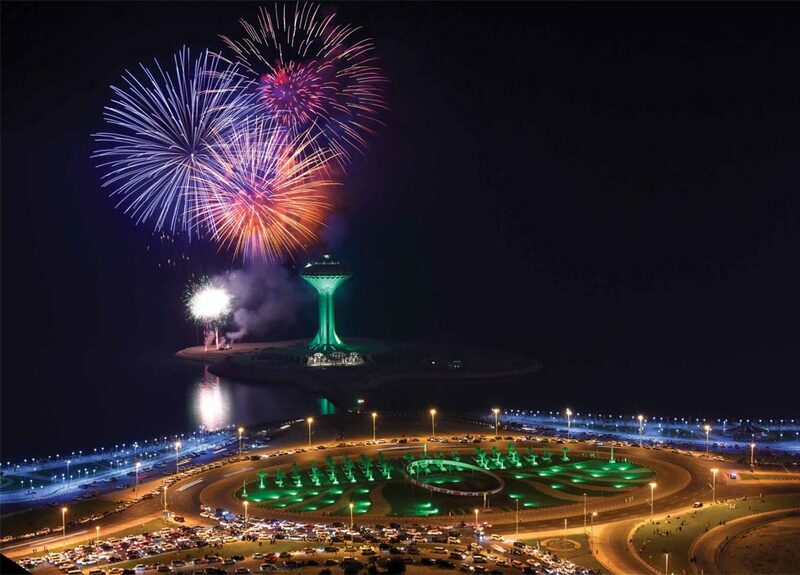 Dhahran — A record-breaking crowd of 38,000 people flocked to the King Abdulaziz Center for World Culture (Ithra) to celebrate Saudi National Day by attending a glittering line-up of festivities hosted over four days. More than 15 events and activities, highlighted local talents, and Saudi productions, were held from Sept. 20-23. On Sunday, Ithra registered its biggest single-day crowd of 19,000 — the largest since its inauguration in December 2016. Gala performance concerts marking Saudi National Day saw popular Saudi singers Abdulrahman Muhammad perform on Sept. 21 and 22, and Faisal Al-Amri from Sept. 20-23. The cinema screened the first in-Kingdom public showing of the Saudi film “Joud,” Saudi Arabia’s first full feature nondialog film produced by Ithra. The film received an international launch at this year’s Cannes Film Festival. For the first time, the Idea Lab opened its doors to festive events and workshops, and the Great Hall put on three showings of the “Air Dance Performance,” a musical and light show using 30 drones. Promoting interest in cultural heritage and national identity was Asir wall paintings, and families had the opportunity to produce their own artwork in the style of the world-famous heritage site. 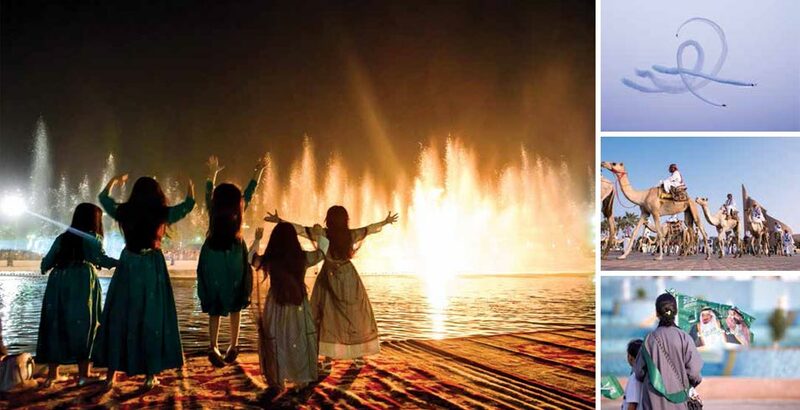 A first for the Dhahran community, performers in a big Saudi operetta take center stage at King’s Park while performing an operetta depicting the Kingdom’s history and the development of Saudi Aramco from a large oil company into an international integrated energy company. Dhahran — For the first time ever, the Central Community Services Department (CCSD) expanded its National Day celebration, going big and inviting Saudi Aramco families to join and celebrate together the monumental day signifying 88 years of prosperityand success for our beloved Kingdom. 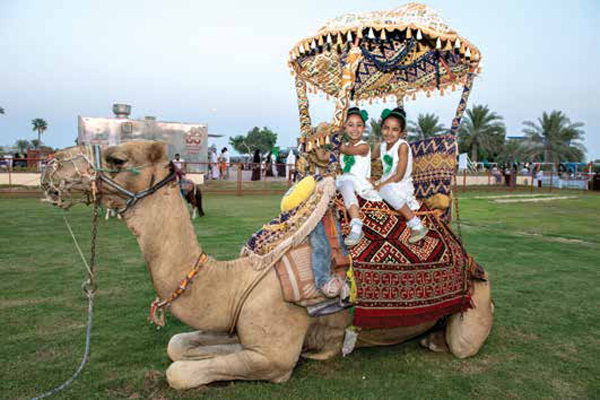 More than 12,000 visitors flocked to King’s Road Park in Dhahran to celebrate the National Day holiday, with CCSD providing a wide variety of entertainment, offerings, and corporate social responsibility activities for the visitors. CCSD supported various charity centers at the event — including the Benaa Center for Orphan Care, the Prince Sultan bin Abdulaziz Fund for Women Development, the Atta AlKher Gulf Girl Charity Association, and the Mashael Al-Khair Charity Center, who provided traditional homemade crafts and products for purchase. Car shows, kids performances, photo booths, car displays, and a chance to leave one’s mark on an autograph board were all a part of the fun at the 88th National Day celebration hosted by the Central Community Services Department. The event proved to be extremely popular among the more than 12,000 visitors.